Summer 17 Think of the things that you would want your immune system to protect you from. Of course, there are the pathogens like viruses, bacteria, and fungi. And of course, you want to be protected from yourself in that you don't want to activate your immune system with self-antigens. But what about "non-biological" molecules like silica or asbestos whose presence might be deleterious? What about normal biomolecules (proteins, nucleic acids) that suddenly find themselves in the wrong cellular location due to cell death by necrosis or physical injury? Damage associated molecular patterns (DAMPs) are typically found on molecules released from the cell or intracellular compartments on cellular damage (hence the name DAMP). Many are nuclear or cytoplasmic proteins released from the cells. These would now find themselves in a more oxidizing environment which would further change their properties. Common DAMP proteins include heat shock proteins, histones and high mobility group proteins (both nuclear), and cytoskeletal proteins. Think what non-protein molecules might be released from damaged cells that might pose problems? Here are some other common non-protein DAMPS: ATP, uric acid , heparin sulfate , DNA and cholesterol crystals. In the wrong location, these can be considered danger signals. As both PAMPs and DAMPs pose dangers, it would make sense that once they recognize their cognate PRRs (TLRs and NLRs, respectively), that pathways leading from the occupied receptors might converge in a common effector system for release of inflammatory cytokines from immune cells. Given that uncontrolled immune effector release from cells in an inflammatory response might be dangerous, it would be sometimes helpful to require two signals to trigger cytokine release from the cell. We've seen this two-signal requirement for the activation of T cells. Two such inflammatory cytokine are Interleukin 1-beta (IL 1-b) and IL-18. Activation of TLRs by a PAMP leads to activation of a potent immune cell transcription factor, NF-kbeta, which leads to transcription of the gene for the precursor of the cytokine, pro-interleukin 1-beta. Without a specific proteolytic cleavage, the active cytokine will not be released from the cell. The protease required for this cleavage is activated by a signal arising when a DAMP activates a NLR, which then through a sequence of interactions leads to the proteolytic activation of another inactive protease, procaspase 1, on a large a multi-protein complex called the inflammasome. (In later chapters we will see other such protein complexes with targeted activities - including the spliceosome, which splices RNA to produce mRNA and the proteasome which conducts controlled intracellular proteolysis). The activated inflammasome activates procaspase to produce the active protein caspase (a cysteine-aspartic protease). The convergence of the signals from the PAMP activation of a TLR and DAMP activation of a NLD at the inflammasome is shown in the figure below. The active cytokine interleukin 1-beta helps recruit innate immune cells to the site of infection. It also affects the activity of immune cells in the adaptive immune response (T and B cels). Active IL-18 leads to the increase of another cytokine, interferon gamma and it also increases the activity of T cells that kill other cells. The focus of this chapter is on binding interaction and their biological consequences. 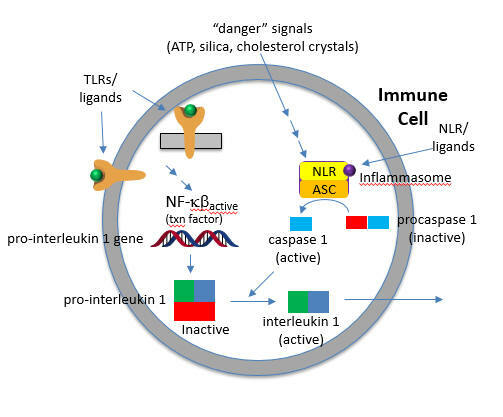 From that perspective, this section will address the structure and activity of caspases which activate the pro-cytokine prointerleukin 1 beta, the structure and ligands for the NLRs, the structure and properties of the inflammasome, and finally how "danger" molecules such as ATP and crystals (cholesterol, silica) activate the inflammasome. Unfortunately, there are a myriad of proteins involved with crazy acronyms for names. These proteins have multiple domains and many of the proteins often have multiple names. Sorry in advance! Caspases (Cys-asp-proteases), not to be confused with Cas9 (CRISPR associated protein 9, an RNA-guided DNA endonuclease) is a protease which when active can lead to cell death, or in a less austere fashion initiate the inflammatory response (sometimes good, often bad or even fatal). They have an active site nucleophilic Cys and cleave peptide bonds after an Asp in target proteins. All caspases (13 in humans) have an N-terminal pro-domain followed by large and small protease catalytic domain subunits. As with other proteases, it is found as an inactive zymogen. Why is this important? To become activated they are recruited to a scaffolding protein where they are activated by removal of the N-terminal pro domain of the zymogen and then a second cut between the large and small catalytic subunits. The enzyme that does this is caspase itself in an autocatalytic step. . There are 3 kinds of caspases, two of which are involved in programmed cell death. We'll discuss the inflammatory cytokine processing Caspase-1. Once activated, the initiators activate other effector (executioner) caspases in the cell) . Caspase 1 is activated by the inflammasome. Two major domains are found in Caspase 1, the caspase recruitment domain (CARD) which mediate self-interaction with scaffold and adaptor proteins in the inflammasome for activation, and a proteolytic catalytic domain, as shown below. All domain structures in the section were obtained using Conserved Domains from the NCBI (https://www.ncbi.nlm.nih.gov/Structure/cdd/wrpsb.cgi) or the Simple Modular Architecture Research Tool (SMART) at the EMBL ( http://smart.embl-heidelberg.de/smart/set_mode.cgi?NORMAL=1 ). Uniprot was used for protein (FASTA) sequences (http://www.uniprot.org/uniprot/). We will see the CARD domain often. The NLRPs are a family of proteins with similar domain structure. The domain structure of three (NLRP1, 2, and 3) are shown below using two different representations. Another protein in the NLR family is NAIP (neuronal apoptosis inhibitor protein). The domain structure for NAIP1 is shown below. In contrast to the other NLR for which specific ligands have not yet been found, several NAIPs have been shown to bind specific PAMPs. NAIP1 binds the needle protein CprI from C.violaceum which starts to drive the assembly of the NLRC4 inflammasome. NAIP2 binds the inner rod protein of the bacterial type III secretion system (which for Salmonella typhimurium is the protein PrgJ). NAIP5 and NAIP6 bind bacterial flagellin (which for Salmonella typhimurium is the protein FliC). AAA is the second domain representation stands for ATP associated activities in the cell (otherwise denoted as the NACHT domain in the top representation). ASC - Apoptosis-associated speck-like protein containing a CARD Adapter domain, allowing it to interact with other proteins with a CARD domain. The active inflammasome, in general, consists of three different kinds of proteins, some present in multiple copies: NLRPs, adapter proteins like ASC, and procaspases. They may also contain additional recruitment and ligand sensor proteins. We'll discuss two types using different NLRPs, the NLRP4 and NLRP3 inflammasome. At present, the best structural information (obtained by cryomicroscopy) is for the NAIP2:NLRP4 inflammasome. 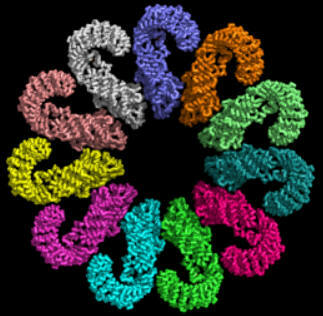 The images and Jsmol models below show part of the complex consisting of 11 NLRP4 subunits arranged in a large ring. The actual biological complex has 1 NAIP2 subunit and 10 NLRP4s. How does this structure arise? Presumably it would not exist in the absence of a PAMP or DAMP so as to minimize immune-mediated inflammatory damage. Data suggests the the bacterial protein PrgJ (denoted PrgX in the figure below) binds to its receptor, NAIP2, altering its conformation as shown below. This binary complex presents an asymmetric electrostatic surface which allows a lose association with NLRP4, which leads, after a conformational change, to a tighter binding interaction. Nine more NLRP4 bind in a similar fashion to form the 11-subunit ring structure. The complementary electrostatic interactions between two of the many NLRC4 subunit monomers in the NLRP4 inflammasome are depicted in the image below. 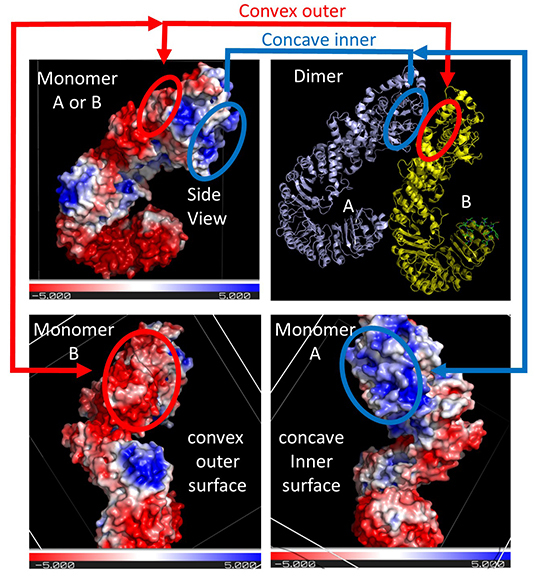 The top right panel shows two of the NLRC 4monomers (of the 12 in the Jsmol model) bound to each other, with the concave inner face of the A subunit interacting with the convex outer face of the B subunit. For simplicity, only the interactions at the top of the dimers are highlighted. The other panels show the electrostatic potential surface (red indicating negative and blue positive) for each monomer on a sliding scale of -5 to +5 (images created using the PDB2PQR Server and Pymol). The depicted negative (red) electrostatic potential outer surface on one NLRC4 monomer that is complementary to the positive (inner) surface on the other NLRC4 subunit are outlined in each panel in red or blue ellipses, respectively. The curved tertiary structure of the proteins and the opposing electrostatic surface potentials of opposite faces commit the subunits to form a large ringed 12-mer core of the nucleosome. 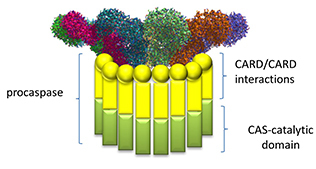 Note that this assembled ring brings together the CARD (caspase recruitment domain, yellow circles/spheres) which can interact with the CARD domain of the procaspase protein through CARD:CARD inter-protein interactions (think of a stack of playing cards all stuck together in a deck of cards). Once assembled, proximal procaspases autocatalytically convert procaspase 1 into active caspase 1, which can activate, by proteolysis, the cytokines interleukin 1 beta and interleukin 18 to form active cytokines which are released from the cell. Remember, the procytokines are present only if their genes from been transcribed by activation of the transcription factor NF-kappa beta through PAMP binding to a TLR. In contrast to NLRP4 inflammasomes which require a defined PAMP/DAMP for activation, NLRP3 inflammasomes seem to be activated by cellular distress as wells as cell exposure to pathogens. It is one of the main responders to a variety of microbial infections. Given the large number of microbes that lead to NLRP3 inflammasome activation, it has been suggest that the actual signal that triggers NLRP3 is indirect. One such indirect signal is K+ ion levels in cells. In normal cells, K+ ions are higher in the cytoplasm than in the outside of the cell (see Chapter 9B: Neural Signaling). Potassium ion decreases in cells caused by efflux can activate NLRP3 inflammasomes. 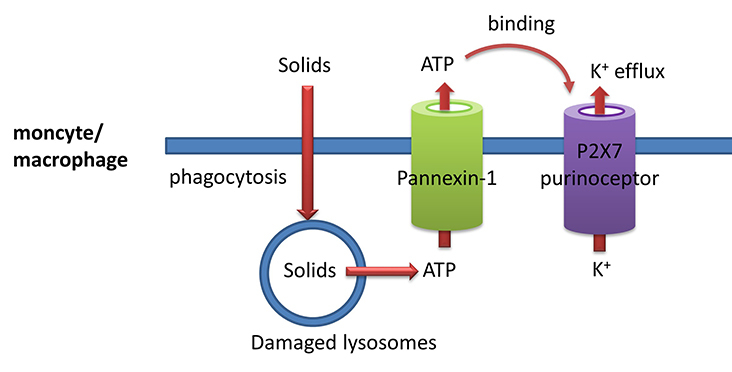 Other conditions include the rupture of lysosomes (perhaps associated with the cellular uptake of particles like silica, uric acid, cholesterol crystals and other "nanoparticles"), altered mitochondrial metabolism (which can lead to reactive oxygen species within the cell), etc. Obviously, all of these danger triggers don't bind to NLPR3 but somehow lead to down stream activation of it. NLRP3 hence probably works by being a general sensor for cell stress. Inappropriate and chronic activation of inflammation has been associated with many disease such as cancer, cardiovascular disease, diabetes and autoimmune diseases. Given the multiple types of signals that can activate the NLRP3 inflammasome, this complex is the focus for active drug development to finds inhibitors that would stop undesired inflammation. These inflammasomes are found in granulocytes, monocytes (macrophages), megakaryocytes, and dendritic cells. Activated NLRP3 recruits the ASC Adaptor Protein, which then leads to recruitment and activation of procaspase 1. NLRP3 has a pyrin, NACHT, and LRR domain. ASC has a pyrin and CARD domain. Active LRP3 can then recruit ASC through pyrin:pyrin inter-protein domain interactions. This then allows the CARD domain of bound ASC to recruit procaspase through CARD:CARD interactions (remember that procaspase has a CARD domain as well), forming the active NLRP3 inflammasome. An added feature of NLRP3 inflammasome activation occurs when the transcription factor NFkb, which is activated by PAMPs (signal 1), leads to the transcription of both the procytokines (IL-1 beta and IL 18) and of NLRP3 itself. The first signals are the bacterial and viral (influenza virus, poliovirus, enterovirus, rhinovirus, human respiratory syncytial virus etc) PAMPs which bind to TLRs and lead to the activation of the NFkb transcription factor. This activates not only the transcription of pro-interleukin 1-beat and interleukin 18, but also to the transcription of the NLRP3 sensor itself. Signal 2 is delivered through PAMPs and DAMPs indirectly to the sensor NLRP3 which leads to the assembly of the inflammasome. These DAMPs appear to prime the activation of NLRP3 protein and subsequent formation of the active NLRP3 inflammasome. But what activates NLR3P3? After many studies, it became clear that the the typical bacterial ligands that would activate TLRs and perhaps NLRs only prime NLRP3 for activation. They don't bind to it directly. Extracellular ATP is a major activator of NLRP3. Nanoparticles are known to release ATP as well. Most studies shown the K+ efflux from the cell is an early signal and that the protein NEK7, a protein that phosphorylates other proteins, binds to NLRP3 after potassium ion efflux and activates it. Removing NEK7 stopped NLRP3 but not NLRP4 inflammasome activation. Although NLRP3 bound to NEK7 through the NEK7 catalytic domain, the activity of the catalytic domain of NEK7 was not needed. - extracellular ATP can bind to another membrane protein called the P2X7 purinoceptor. This protein now becomes a cation channel which allows K+ efflux since the ion has a higher concentration inside the cell than outside. The extracellular ATP "gates" open the P2X7 cation channel. The pore-forming toxin nigericin from Streptomyces hygroscopicus also leads to potassium ion efflux. Likewise, pore-forming proteins from S. aureus (hemolysins) lead to potassium ion efflux and activation of the NLRP3 inflammasome. Other signals also activate the NLRP3 inflammasome. The include mitochondrial damage and release of reactive oxygen species.